Intellinet 12 Port Passive PoE Patch Panel - 24 Port Patch Panel with 12 port RJ45 Data In and 12 port RJ45 Data and Power Out, Retail Box, 2 year Limited Warranty. Do you need a cost effective solution to upgrade your Network with Power over Ethernet? Then the 720342 from Intellinet is your ideal solution. Intellinet is renowned for their PoE products and this is one of our latest additions. For extra security in your server room patch panels, I.T. Department test bench or network access points, the new range of Locking Function Patch Panels, Keystones, Inline Couplers and mount boxes will inevitably be of interest to you and your I.T. team. Recommended for all businesses and currently utilized in financial institutions, hotels, airports, schools, hospitals and retail stores. Excellent in areas where vibration can loosen a standard RJ45 connection such as in trains, aircraft and in the vicinity of vibrating machinery. 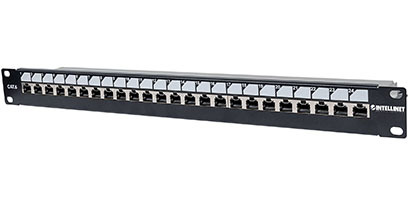 Intellinet Cat6 Patch Panel - 48-Port, UTP, 2U, Retail Box, 2 year Limited Warranty. The backbone of your network is central to your organization's success. Trust Intellinet to provide Patch Panels that maintain the integrity of your data. The Patch Panel enables you to quickly change the port assignment of any piece of equipment that's attached to your network. Our range of Patch Panels feature varying port densities across a complete range of specifications–from Cat5e to Cat6a in both Unshielded and Shielded varieties. All Patch Panels comply with current industry standards and are 19”-rack compliant. The backbone of your network is central to your organization's success. Trust Intellinet Network Solutions to provide Patch Panels that maintain the integrity of your data. The Patch Panel enables you to quickly change the port assignment of any piece of equipment that's attached to your network. Our range of Patch Panels feature varying port densities across a complete range of specifications–from Cat5e to Cat6a in both Unshielded and Shielded varieties. All Patch Panels comply with current industry standards and are 19”-rack compliant. Intellinet Cat5e Patch Panel - 48-Port, UTP, 2U, Retail Box, 2 year Limited Warranty. 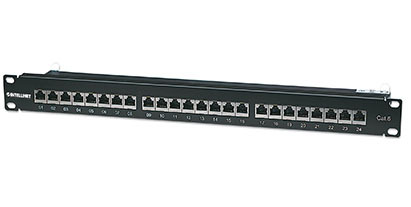 Intellinet Cat6 Patch Panel - 24-Port, UTP, 1U, Retail Box, 2 year Limited Warranty. Intellinet Cat6 Patch Panel - 16-Port, UTP, 1U, Retail Box, 2 year Limited Warranty. Intellinet Cat5e Patch Panel - 16-Port, UTP, 1U, Retail Box, 2 year Limited Warranty. The Netix /UniQue 32-port Blank Keystone Patch Panel has cut-outs that accept all snap-in Keystone Jacks, making it perfect for Ethernet, voice or audio/video applications. Clearly numbered 1-32 on the front allows you to easily identify cable runs. Mounts on any standard 19" Relay Rack, Cabinet, or Wall Bracket. Dimensions: 3.5"x19", 2 rack spaces. 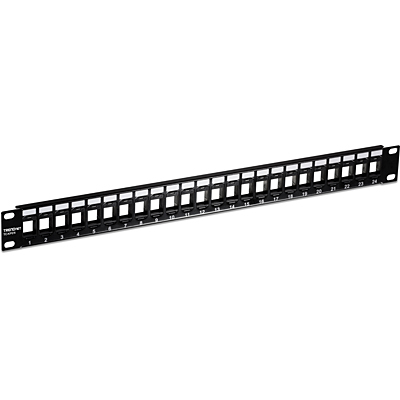 The Netix /UniQue 16-port Blank Keystone Patch Panel has cut-outs that accept all snap-in Keystone Jacks, making it perfect for Ethernet, voice or audio/video applications. Clearly numbered 1-16 on the front allows you to easily identify cable runs. Dimensions: 1.75"x19", 1 rack space. TRENDnet’s 24-Port Blank Keystone 1U Patch Panel, model TC-KP24, is designed for use with TRENDnet’s Cat6 keystone jacks (TC-K25C6 and TC-K50C6). When used together, they create a patch panel solution suitable for gigabit and 10G Copper Ethernet network applications.